Five women have been killed in eastern India by villagers who believed they were witches, according to local officials. The killings took place in a rural community in the state of Jharkhand, where there are frequent reports of fatal attacks on women who locals say have cast curses that are blamed for poor crops, illness or misfortune. The killings often disguise family feuds or land disputes. In the latest incident villagers with sticks and knives attacked the five women on Friday night in the town of Kanjia, police officials said. “The women were dragged out of their home while asleep and beaten to death by the villagers suspecting them to be witches … some were even stoned to death,” said Jharkhand police spokesperson SN Pradhan. Police said the attackers packed the victims’ bodies in sacks and discarded them outside the village boundary, according to witnesses. Police said the arrested villagers did not show any remorse. “What can you expect from the society when even educated youths join the angry mob?” said a local lawmaker, Gangotri Kujur, who visited the spot afterwards. 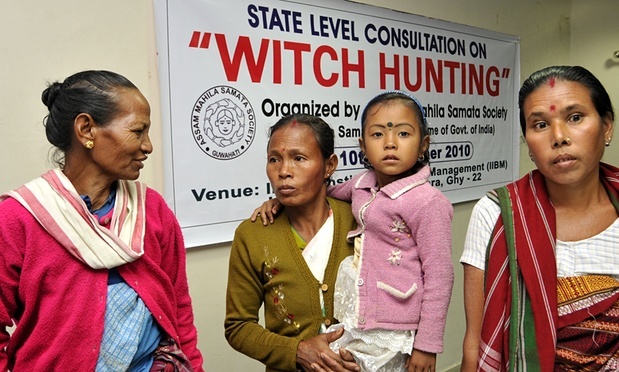 According to Indian government statistics around 2,000 people, almost all women, were killed after being branded witches between 2000 and 2012. Many attacks go unreported, campaigners say. In July police in the north-eastern state of Assam arrested 16 people after the killing of an alleged witch. Authorities said at least 90 people had been stabbed, burned or killed in other ways over the previous six years in the state.